Home Tags Posts tagged with "William Sidney Mount"
Now through Sept. 3, The Long Island Museum in Stony Brook presents a delightful treat: a special exhibit titled Perfect Harmony: The Musical Life and Art of William Sidney Mount. William Sidney Mount (1807-1868) was a renowned artist best known for his genre paintings, although he also painted landscapes and portraits. Born in Setauket, Mount lived in Stony Brook and painted many local scenes. A man of many talents, Mount was also a musician (he played the fiddle and fife), composer and inventor, designing a hollow-back violin that he named the Cradle of Harmony. So many of Mount’s paintings incorporate music into the scene, whether it is dancing or playing a musical instrument so it was only natural to “connect his two major passions in life,” according to the exhibit’s curator, Joshua Ruff, director of collections and interpretations and chief curator at The LIM. Currently on view in the Victoria V. Costigan Gallery in the Art Museum on the hill, the fascinating exhibit links Mount’s music and art with more than 20 oil paintings, pencil drawings, musical instruments, original compositions and more. Of course, it is the incredible oil paintings, drawn from the museum’s unsurpassed collection, that take center stage. “Catching the Tune,” “Dancing on the Barn Floor,” “Just in Tune” and the famous “Dance of the Haymakers,” among others, are displayed in all their glory. Situated toward the center of the room is a unique music stand that Mount illustrated with sheet music of early American folk tunes including “Dearest Ellen” and a patriotic Fourth of July song. “These musical pieces were popular in the 19th century,” explained Ruff during a recent tour. The stand was designed to accommodate four musicians at a time and Ruff said that Mount most likely used it. “I would be surprised if he didn’t,” said the curator. Also on display are some of Mount’s compositions including “In the Cars on the Long Island Railroad” and “The Musings of an Old Bachelor,” as well as musical instruments — a tin whistle, hornpipe, tuning fork — which belonged to the Mount family. A piano owned by Mount’s uncle Micah Hawkins sits in the corner. A General Store owner at Catherine’s Market in lower Manhattan, Hawkins composed music and to some extent was an influence to Mount “but his whole family was passionate about music,” said Ruff. Along with Mount’s personal violin and initialed case, three prototypes of Mount’s Cradle of Harmony are also on view. “It’s nice that we were able to have all three examples of the violin that he designed and we have the 1852 patent design drawing for the first one,” the curator said. In the background, a video plays several of Mount’s compositions, initially recorded by violinist Gilbert Ross for the Smithsonian in 1976 on its own Cradle of Harmony, tying the exhibit together perfectly. The Atelier at Flowerfield, 2 Flowerfield, St. James will present a lecture on the Perfect Harmony exhibit with guest speaker, curator Joshua Ruff, on Thursday, April 12 from 7 to 8:30 p.m. in Atelier Hall featuring an early American fiddle performance by Director Kevin McEvoy. Suggested donation is $10. For more information, call 631-250-9009. On Saturday, April 14, The LIM will host a concert by the Manhattan-based Red Skies Music Ensemble at 2 p.m. The group will bring Mount’s music and art to life through visual imagery and theatrical interpretation of songs from the artist’s own collection. One of the musicians will play Mount’s Cradle of Harmony. Followed by a Q&A. Admission is $20 adults, $18 seniors, $15 members and students. To register, call 631-751-0066, ext. 212. Students in grades K through 4 can take part in an after school program, Hands-On Art, on Thursday, May 3 from 4:30 to 5:30 p.m. by visiting the Perfect Harmony exhibit and taking inspiration from William Sidney Mount to combine music and art. $10 per child. To register, call 631-751-0066, ext. 212. 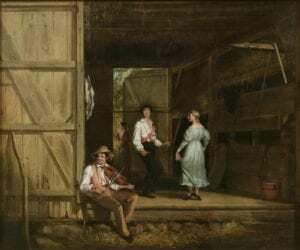 The Long Island Museum, 1200 Route 25A, Stony Brook will present Perfect Harmony: The Musical Life and Art of William Sidney Mount through Sept. 3. The museum is open Thursday, Friday and Saturday from 10 a.m. to 5 p.m. and Sunday from noon to 5 p.m. Admission is $10 adults, $7 seniors, $5 students, children 5 and under free. For further information, call 631-751-0066 or visit www.longislandmuseum.org. William Sidney Mount, Setauket and Stony Brook’s famous genre artist, was a keen observer of nature and human nature, and he enjoyed traveling around Long Island, especially his native villages of Stony Brook and Setauket. In 1853, Mount wrote to his friend Chauncey Marvin Cady about walking through a former slave burial ground on the family farm and noticing a beautifully carved gravestone. It is believed the graveyard is located behind the Hawkins-Mount house at Stony Brook Road and Route 25A. William Sidney was not the only Mount who appreciated the gravestones in the “former slave burial ground.” In The Long Island Museum collection is an unsigned painting attributed to his brother Shepard Alonzo Mount that features two gravestones standing as silent sentinels in an otherwise bucolic scene — one the gravestone of Anthony Hannibal Clapp. The epitaph on the tombstone for Clapp was composed by Micah Hawkins, uncle of William Sidney and composer of “The Saw-Mill, or a Yankee Trick,” America’s first performed operetta. The stone was carved by Phineas Hill, a stone carver from Huntington. The edited copy from The Long Island Museum Art Collection reads: “Entirely tone less; honor and shame from no condition rise — Act well thy part, there all the honor lies. Anthony Hannibal Clapp. Above, a portrait of Leonard A. Zierden, age 4, March 1900, with his Jack Russell Terrier (Star Studio, Johnsonburg, PA) will be on view at The LIM through Dec. 31. As the dog days of summer are brought in with the August heat, The Long Island Museum in Stony Brook will also put dogs in the spotlight. Starting Aug. 11, the Art Museum on the hill will feature an exhibit titled Dog Days: Portraits of Man’s Best Friend. The exhibit’s collection will focus on works from the 1840s to the 1960s featuring dogs. “This gallery tends to be devoted to changing exhibits drawn from our permanent collection,” Assistant Curator Jonathan Olly said of the room currently preparing for the Dog Days exhibit. The exhibit will open tomorrow, Aug. 11, and run through Dec. 31. Beneath the gallery resides the vault storing the museum’s art collection. “It’s kind of a continuing challenge of coming up with new ways to look at the collection and put together themes,” Olly said. Olly got the idea to draw together works highlighting dogs after gaining inspiration from a cat-centric exhibit at the Worcester Art Museum in Massachusetts. Realizing the fact that Long Islanders love their dogs led him to curate the Dog Days exhibit. “When most people were living on a farm, farms had dogs because they were pets but they’re also practical. They could catch pests, they could guard the homestead from intruders,” he said. There are about 20 major works in the gallery, from watercolor and oil painting to photographs. There will also be a display case featuring smaller objects such as dog show tags, ribbons from the North Shore Kennel Club in St. James, postcards that have advertising containing dogs, ornaments that were pinned on horse wagons leather straps and even a pair of slippers with dog’s faces embroidered on them. Famous artists William Sidney Mount and William Moore Davis have pieces on display. Mount was a 19th-century genre and portrait painter who lived in Setauket and Stony Brook. The museum has the largest collection of his works. Davis, a friend of Mount’s, resided in Port Jefferson and is known for his landscape paintings. “They are the two artists that are most strongly represented in the show. That’s because they were local people and they both depicted scenes of regular people on Long Island at work, at play, at rest — and often dogs were part of the scene,” Olly said. The interesting part of the gallery is that in most of the works the dogs are not the most prominent part of the piece. Often, they were just another component in the scene, which draws a comparison to how they were (and are) just another part of Long Islander’s lives. “A lot of the things that we’re working with in here tend to be things that have come into the collection not because they’re dog-related, but the fact they have dogs is almost accidental,” Olly said. This is the case in Alexander Kruse’s 1969 painting “Bicycle Parking Fire Island,” which is the most current piece in the exhibit. “He didn’t paint it because of the dog, but he just happened to include a dog,” Olly said. One of the most interesting pieces featured, according to Olly, is a painting illustrating a scene of the Meadow Brook Hounds. Fox hunting was a popular sport for Long Island’s elite in the late-nineteenth and twentieth centuries. There were three main fox hunting organizations on Long Island during this time: The Meadow Brook Hounds (1881-1971), Suffolk Hounds (1902-1942) and Smithtown Hunt (1900-present). The painting of the Meadow Brook Hounds is particularly interesting because it’s one of the few where the dogs are a major part of the scene. The painting is accompanied by a label that not only names important figures portrayed in the piece, like Theodore Roosevelt, but also credits the dog’s names. “The dogs are actually getting equal billing with the people,” Olly said. In conjunction with the Dog Days exhibition, The Long Island Museum will present its third Summer Thursday event on Aug. 17 from 6 to 8 p.m. with a concert by the Cuomo Family Band. Visitors are encouraged to pack a picnic dinner and bring chairs or blankets. Admission to the grounds and exhibit is free. Shelter dogs from Last Chance Animal Rescue will be available for adoption and The Middle Country Public Library’s Mutt Club, which partners with animal rescue organizations, will be collecting donations for shelter pets including pet food, toys, treats, collars, cat litter, toys, cleaning supplies and peanut butter. Dog Days: Portraits of Man’s Best Friend is a chance for North Shore residents to see the beloved pets in an artistic light. Stop by the gallery to see just how man’s best friend has been captured over the past centuries on Long Island. The Long Island Museum, a Smithsonian Affiliate, is located at 1200 Route 25A in Stony Brook. Regular museum hours are Thursday through Saturday from 10 a.m. to 5 p.m. and Sunday from noon to 5 p.m. For more information, call 631-751-0066 or visit www.longislandmuseum.org. The Long Island Museum in Stony Brook bid bon voyage to William Sidney Mount’s painting, “Catching Rabbits” recently. The politically themed painting is on loan to the Dixon Gallery & Gardens in Memphis, Tenn., through Jan. 15 as part of a new exhibition titled Wild Spaces, Open Seasons: Hunting and Fishing in American Art, which celebrates artists’ captivation with hunting and fishing. As we are bombarded with political messages in this historically significant presidential election, we can stop and examine the ironically parallel politics of Mount’s day depicted in his painting. While the painting at first appears to be the triumphant illustration of two boys successfully trapping game, the underlying subject of “Catching Rabbits” is the contest between Democrats and Whigs in the 1840 presidential election. The boys in the painting represent the Whig Party “trapping” votes, while the rabbit signifies the Democratic Party, weakened by internal division and subjected to desertion by its membership. Mount’s imagery proved so apt that the Democrats adopted the concept of the trap for their campaign broadsides, which cautioned against being lured and caught by the Whigs. The cooler weather, shorter days and leaves of autumn reds, oranges and gold signal the arrival of the Three Village Historical Society’s annual Spirits Tour. Now in its 22nd year, this year’s event, with the theme “William Sidney Mount: Family, Friends & Ideas,” will be held on Saturday, Oct. 22 with tours starting at 5 p.m.
Born in Setauket in 1807, William Sidney Mount was an incredible artist best known for his genre paintings (portraits and scenes from everyday life) of Long Island, most notably “Dance of the Haymakers,” (1845) “Farmers Nooning” (1836) and “Dancing on the Barn Floor” (1831). His paintings often commented on American social and political issues and by the middle of the nineteenth century, he was one of the most renowned artists in America. He is buried at the Setauket Presbyterian Church across from the Village Green. The Long Island Museum in Stony Brook boasts the largest collection of Mount’s paintings, thanks to gifts by philanthropists Ward and Dorothy Melville, along with his diaries. Guided walking tours will lead guests through the historic cemeteries of the Setauket Presbyterian Church and the Caroline Church of Brookhaven. The “spirit” of William Sidney Mount with his family and friends will greet visitors along the way. Actors in period costumes supplied by Antiques Costume & Prop Rental by Nan Guzzetta will play the parts of Mount’s mother, brothers Henry and Shepard, his sister Ruth along with people who commissioned paintings from him, including Lumen Reed, his principal sponsor in New York. Reed would eventually donate his collection of the artist’s paintings to the New York Historical Society. Rachel Holland Hart, played by Bonnie Duvall, who is featured in Mount’s classic painting, “Eel Spearing at Setauket,” will also make an appearance. As a special treat, the tour will include a visit with members of the Setalcott Nation, Helen “Morningstar” Sells and Nellie Edwards, on the Village Green. Frank Turano, co-chair of the committee and Historical Society Trustee, wrote the script for this year’s event. According to Turano, the Spirits Tour serves as both an educational event for the community and a fundraiser for the Three Village Historical Society. Previous tours have explored themes such as the Culper Spy Ring and Service to Country and Community as well as featuring prominent families in the area such as the Strongs. “Mount was a man for all seasons in the 19th century,” said Turano. Along with being very influential in the art world, with sponsors in New York, “he invented a violin named the Cradle of Harmony, which was designed to be louder than the typical fiddle of the day.” Turano said Mount’s paintings also give us good insight into the manner and dress of the people in Setauket in the early 1800s as a rural farming settlement. “How did the common people dress? What did they look like? He’s a character bigger than the community and that’s why he’s the focal point here,” said Turano. Tours will leave from the Setauket Presbyterian Church, 5 Caroline Ave., Setauket every 15 minutes starting at 5 p.m. and last for approximately 1 1/2 to 2 hours. The last tour departs at 7:45 p.m. It is advised to dress warmly, wear comfortable shoes and bring a flashlight. Tickets in advance are $18 adults, $15 members; $10 children under 12, $8 members. Tickets on the night of the event are $25 adults, $20 members; $12 children under 12, $10 members. Copies of the Three Village Historical Society’s book, “William Sidney Mount: Family, Friends and Ideas” will be available for purchase for $3 on the night of the event. Rain date is Sunday, Oct. 23. To order tickets, call 631-751-3730 or visit www.tvhs.org. In conjunction with the tour, the Long Island Museum, 1200 Route 25A, Stony Brook will showcase its current exhibit in the Art Museum on the hill: “Drawn from Life: Objects and Stories from William Sidney Mount’s Paintings” and Mora’s Fine Wines will host a wine and spirit tasting event with hors d’ouevres at Madiran the Wine Bar, 209 Main St., E. Setauket on Oct. 22 from 1 to 4 p.m. Tickets for the wine tasting are $39.99. To order, please visit www.moraswines.com. The Long Island Museum in Stony Brook revealed its newest exhibit, Drawn from Life: Objects and Stories from William Sidney Mount’s Paintings Aug. 12. Mount was an early 19th-century genre artist who lived from 1807 to 1868. Born in Setauket, Mount spent much of his career in Stony Brook. He is buried in the Setauket Presbyterian Church’s Cemetery. Julie Diamond, director of communications at the museum, noted that the William Sidney Mount house, located on the corner of Route 25A and Stony Brook Road in Stony Brook, is preserved to this day. Mount had his studio in the third-floor attic of the house, which was built in 1725 and became a National Historic Landmark in 1965. The Long Island Museum has the largest collection of Mount’s work and memorabilia in the world. His paintings show ordinary people doing ordinary things: washing laundry, dancing to the music of a violin, fishing, trapping, etc. He was a contemporary of the Hudson River School of painting. The exhibit is curated by museum assistant curator Jonathan Olly. New to the LIM since February, he earned a doctorate in American studies just a few years ago from Brown University. Although this is his first major exhibit at the LIM, he knew he wanted to become a museum curator back when he was a summer intern in Washington, D.C., at the National Museum of American History. “I’ve been working in museums since 2001,” he said. One of the really unique paintings on view is the portrait of Robert Morris Russell. According to Olly, Mount painted it in 1832 along with a portrait of Russell’s wife and mother. The painting has not been on display “in over 40 years.” It needed conservation, which was provided through a Greater Hudson Heritage grant. Olly noted that in assembling the exhibit “we also drew on our textile collection to outfit mannequins.” An 1830s black dress and a man’s black waistcoat are paired with these two portraits. While some of the objects paired with each particular painting are of the period, a few are actually the items Mount painted. One of Mount’s original easels is on display, along with one of his violins. The 1857 instrument, one of the Cradle of Harmony violins he designed, was unique in that it had a concave, instead of a usual convex, back in order to “create a larger sound in a crowded room,” at a time when there was no electricity — no amplifiers. “He used and played the violin himself, but there was never any interest in manufacturing it,” said Olly. The violin is paired with “Catching the Tune,” showing a fiddler holding that actual instrument. In the portrait of Mount’s sister Ruth, she is shown with her child, Charles. The original dress that the baby is wearing in the painting is on display as well. Six paintings are paired with current photos of the same locations. Most of these were taken by Olly, including that of Patriot’s Rock in Setauket. The photo of the barn, shown above, was taken several years ago by Diamond. “The doorway of the barn frames the image that Julie took of three kids, in programs,” held at the museum. The barn is the Williamson barn, believed to be the one Mount painted in “Dancing on the Barn Floor,” below, which was moved to the LIM property for preservation. Olly added, “it’s amazing that these places still do survive,” after more than 150 years. Seniors age 62 and over are invited to visit the museum (free admission) on a normally closed day, Sept. 13, to take a self-guided tour of the exhibit from 10 a.m. to noon as part of the museum’s Senior Tuesday program. The new Mount exhibit will be used in the museum’s children’s programs as well, including Meet the Museum: A World Without Cars (with a focus on carriages), Meet the Museum: Through an Artist’s Eyes (with a focus on art) and The New Nation: The World of William Sidney Mount (focusing on business and transportation). Detailed teacher’s information is available for download on the museum’s website. The Long Island Museum, 1200 Route 25A, Stony Brook will present Drawn from Life: Objects and Stories from William Sidney Mount’s Paintings through Dec. 31 in the Art Museum on the hill. The museum, a Smithsonian affiliate, is open Thursdays through Saturdays from 10 a.m. to 5 p.m. and Sundays from noon to 5 p.m. For further information, call 631-751-0066 or visit www.longislandmuseum.org. Today, youngsters all seem to be tied to websites, texting, apps and more. They’ve got their headphones on and download the latest music. Until recently, children had to make do without electricity. They played games (nonelectronic), enjoyed music (which people had to make themselves) and danced. School didn’t feature “smart” classrooms. While children today have chores, in the agrarian past children’s jobs were very different: They gathered eggs from their chickens, went fishing and trapping and helped hang the laundry out on the clothesline. Gender conventions were stronger then. Girls played with dolls and boys with trains. To provide a glimpse into early 19th-century children’s lives on Long Island, the Long Island Museum of American Art, History and Carriages in Stony Brook has opened a new exhibit, “Young Island,” showing a collection of William Sidney Mount’s paintings that depict children’s lives in the years before, during and just after the Civil War. Mount was a 19th-century Setauket artist who is known for his paintings of everyday life. In an age before the camera, he also did portraits, many of children. “Catherine Adele Smith,” “Maria Winthrop Seabury,” “Young Girl” and “Tutie [Ruth Hawkins Mount]” are all examples of those many portraits, all part of the current exhibit. Children teased and played around — yes, they were naughty then too, shown in “Mischievous Drop” and “Boys Wrangling,” and they had work to do. “Returning from the Orchard” shows a young girl who has gathered fruit, “Catching Rabbits” shows boys emptying a trap, and “Boy Hoeing Corn” shows a child working in the field. The idea for the exhibit was Joshua Ruff’s, director of collections and interpretation. “The idea came from the fact that we often have a Mount exhibit, especially during the school year … We’ve never done an exhibit with children before so it seemed like a good fit,” said Julie Diamond, director of communications at the museum. “It’s an easy theme to recognize for Mount … when you look through the several thousand drawings we own as well as the more than one hundred oil paintings, children play a significant role in both his genre and portraiture. Mount himself was surrounded by children in daily life, living under the same roof as both of his brothers’ large families. He had many nieces and nephews,” said Ruff. “Children are featured in his work in a myriad of ways — representing innocence, a young nation’s optimism, political points etc. Since this was also a time that children worked extensively on the American/Long Island farm, there’s that element too. Mount is like a fair number of other American artists of the 19th century — Winslow Homer, Eastman Johnson and others — who are using children in both allegorical and realistic ways in their work. So it’s a great theme to explore, even in a fairly small exhibit such as this,” he added. Selecting the works to be included in the exhibit was a challenge. “Choice of the work was not easy,” said Ruff. “There are literally dozens of excellent drawings and paintings that could have been included, but this is our smaller gallery, so space only allows 18 works,” especially since many of Mount’s paintings are large. One of the best known of Mount’s works is “Dance of the Haymakers,” which shows workers in a barn dancing to a fiddler’s music. Outside, a small boy beats time to the music on the side of the barn with sticks. A dog lays on the ground and farm tools are propped up against the side of the barn. “We wanted to show ‘Dance,’ not only because it relates to the theme, but also because it is going out on national loan to the Detroit Institute of Arts next year. One of the most important aspects of this exhibit for us is that we will be able to use it very well with our educational programming,” said Ruff. Diamond added that the LIM has programs for school groups, one geared for kindergarten through second grade and another for fourth through sixth grade. “Both use the Mount exhibit as the basis for learning,” about American history. “Also, it is a very good little family show. In addition to the regular labels/text, there are also labels for families. We hope that it will give people a chance to think about a side of Mount that they may not have considered much before,” said Ruff. “Young Island” is scheduled to run through the end of the year. The LIM, a Smithsonian affiliate, is located in Stony Brook at 1200 Route 25A. It is open Thursday through Saturday, 10 a.m. to 5 p.m., and Sunday, noon to 5 p.m. For further information, call 631-751-0066 or visit www.longislandmuseum.org.